Owning a Dodge means that you are investing in quality craftsmanship and a great overall vehicle. Used Dodge cars for sale in Seattle will give you the pricing that you are looking for as well instead of paying the hefty price for a brand new option. Once you know that a Dodge is something that you need to have in your family, you will find a great selection at Carson Cars. All you have to do is either call the customer service team to find out about the current selection of Dodge vehicles or make some time so that you can visit the dealership to browse the lot on your own. When you have any questions on a particular model that you are interested in, the customer service team will be more than happy to go over the vehicle with you and even grab the keys so that you can head out on the road for a test drive. Are you worried that you have poor credit or no credit at all that will be holding you back from a new vehicle purchase? If so, you should know that Carson Cars offers a finance team that works in-house to get you the loan that you need and at a rate that is very affordable. As a matter of fact, the finance team will work so hard to get you a loan that if something goes wrong and you are unable to get financed, we will actually pay you $500 for your troubles. 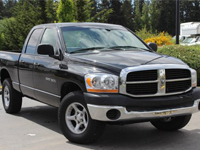 Buy your next vehicle with Carson Cars and shop used Dodge cars for sale in Seattle. Call us (855)583-9356 today for selection and pricing information or stop by to take a new to you Dodge for a test drive.